Stonehenge, Wiltshire, United Kingdom, is one of the world's best known megalithic structures. A megalith is a large stone that has been used to construct a structure or monument, either alone or together with other stones. The word megalithic describes structures made of such large stones without the use of mortar or concrete, representing periods of prehistory characterised by such constructions. For later periods, the word monolith, with an overlapping meaning, is more likely to be used. The word megalith comes from the Ancient Greek μέγας (transliteration mégas, meaning "great") and λίθος (transliteration líthos meaning "stone"). Megalith also denotes one or more rocks hewn in definite shapes for special purposes. It has been used to describe buildings built by people from many parts of the world living in many different periods. The term was first used in reference to Stonehenge by Algernon Herbert in 1849. A variety of large stones are seen as megaliths, with the most widely known megaliths not being tombs. The construction of these structures took place mainly in the Neolithic period (though earlier Mesolithic examples are known) and continued into the Chalcolithic period and the Bronze Age. At a number of sites in eastern Turkey, large ceremonial complexes from the 9th millennium BC have been discovered. They belong to the incipient phases of agriculture and animal husbandry. Large circular structures involving carved megalithic orthostats are a typical feature; e.g. at Nevalı Çori and Göbekli Tepe. Although these structures are the most ancient megalithic structures known so far, it is not clear that any of the European megalithic traditions (see below) are actually derived from them. At Göbekli Tepe, four stone circles have been excavated from an estimated 20. Some measure up to 30 metres across. As well as human figures, the stones carry a variety of carved reliefs depicting boars, foxes, lions, birds, snakes and scorpions. Dolmens and standing stones have been found in large areas of the Middle East starting at the Turkish border in the north of Syria close to Aleppo, southwards down to Yemen. They can be encountered in Lebanon, Syria, Iran, Israel, Jordan, and Saudi Arabia. The largest concentration can be found in southern Syria and along the Jordan Rift Valley, however they are being threatened with destruction. They date from the late Chalcolithic/Early Bronze Age. Megaliths have also been found on Kharg Island and pirazmian in Iran, at Barda Balka in Iraq. Standing stone in Amman, Jordan. A semicircular arrangement of megaliths was found in Israel at Atlit Yam, a site that is now under the sea. It is a very early example, dating from the 7th millennium BC. The most concentrated occurrence of dolmens in particular is in a large area on both sides of the Jordan Rift Valley, with greater predominance on the eastern side. They occur first and foremost on the Golan Heights, the Hauran, and in Jordan, which probably has the largest concentration of dolmen in the Middle East. In Saudi Arabia, only very few dolmen have been identified so far in the Hejaz. They seem, however, to re-emerge in Yemen in small numbers, and thus could indicate a continuous tradition related to those of Somalia and Ethiopia. The standing stone has a very ancient tradition in the Middle East, dating back from Mesopotamian times. 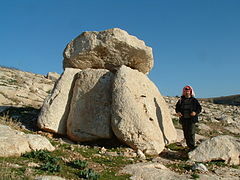 Although not always 'megalithic' in the true sense, they occur throughout the Orient, and can reach 5 metres or more in some cases (such as Ader in Jordan). This phenomenon can also be traced through many passages from the Old Testament, such as those related to Jacob, the grandson of Abraham, who poured oil over a stone that he erected after his famous dream in which angels climbed to heaven (Genesis 28:10-22). Jacob is also described as putting up stones at other occasions, whereas Moses erected twelve pillars symbolizing the tribes of Israel. The tradition of venerating (standing) stones continued in Nabatean times and is reflected in, e.g., the Islamic rituals surrounding the Kaaba and nearby pillars. Related phenomena, such as cupholes, rock-cut tombs and circles also occur in the Middle East. The most common type of megalithic construction in Europe is the portal tomb – a chamber consisting of upright stones (orthostats) with one or more large flat capstones forming a roof. Many of these, though by no means all, contain human remains, but it is debatable whether use as burial sites was their primary function. The megalithic structures in the northwest of France are believed to be the oldest in Europe based on radiocarbon dating. Though generally known as dolmens, the term most accepted by archaeologists is portal tomb. However many local names exist, such as anta in Galicia and Portugal, stazzone in Sardinia, hunebed in the Netherlands, Hünengrab in Germany, dysse in Denmark, and cromlech in Wales. It is assumed that most portal tombs were originally covered by earthen mounds. Another type of megalithic monument, the single standing stone, or menhir as it is known in France, is very common throughout Europe, where some 50,000 examples have been noted. Some of these are thought to have an astronomical function as a marker or foresight. In some areas, long and complex alignments of such stones exist, the largest known example being located at Carnac in Brittany, France. In parts of Britain and Ireland a relatively common type of megalithic construction is the stone circle, of which examples include Stonehenge, Avebury, Ring of Brodgar and Beltany. These, too, display evidence of astronomical alignments, both solar and lunar. Stonehenge, for example, is famous for its solstice alignment. Examples of stone circles are also found in the rest of Europe. The circle at Lough Gur, near Limerick in Ireland has been dated to the Beaker period, approximately contemporaneous with Stonehenge. The stone circles are assumed to be of later date than the tombs, straddling the Neolithic and the Bronze Ages. 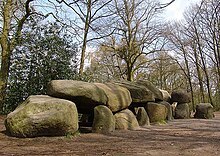 Large T shaped Hunebed D27 in Borger-Odoorn, Netherlands. Megalithic tombs are aboveground burial chambers, built of large stone slabs (megaliths) laid on edge and covered with earth or other, smaller stones. They are a type of chamber tomb, and the term is used to describe the structures built across Atlantic Europe, the Mediterranean, and neighbouring regions, mostly during the Neolithic period, by Neolithic farming communities. They differ from the contemporary long barrows through their structural use of stone. There is a huge variety of megalithic tombs. The free-standing single chamber dolmens and portal dolmens found in Brittany, Denmark, Germany, Ireland, Netherlands, Sweden, Wales, and elsewhere consist of a large flat stone supported by three, four, or more standing stones. They were covered by a stone cairn or earth barrow. In Italy, dolmens can be found especially in Sardinia. There are more than 100 dolmen dating to the Neolithic (3500–2700 BC) and the most famous is called Dolmen di Sa Coveccada (near Mores ). During the Bronze Age, the Nuragic civilization built c. 800 Giants' grave, a type of megalithic gallery grave that can be found throughout Sardinia with different structures. The earliest megalithic tombs in Sardinia are the circular graves of the so-called Arzachena culture, also found in Corsica, southern France and eastern Spain. Dolmen are also in Apulia and in Sicily. In this latter region, they are small structures located in Mura Pregne (Palermo), Sciacca (Agrigento), Monte Bubbonia (Caltanissetta), Butera (Caltanissetta), Cava Lazzaro (Siracusa), Cava dei Servi (Ragusa), Avola (Siracusa), Argimusco in Montalbano Elicona (Messina). Dating to the early Bronze Age (2200–1800 BC), the prehistoric Sicilian buildings were covered by a circular mound of earth. In the dolmen of Cava dei Servi, the archaeologists found numerous human bone fragments and some splinters of Castelluccian ceramics (Early Bronze Age) which confirmed the burial purpose of the artefact. Examples with outer areas, not used for burial, are also known. The Court Cairns of southwest Scotland and northern Ireland, the Severn-Cotswold tombs of southwest England and the Transepted gallery graves of the Loire region in France share many internal features, although the links between them are not yet fully understood. That they often have antechambers or forecourts is thought to imply a desire on the part of the builders to emphasize a special ritual or physical separation of the dead from the living. The passage graves of Orkney, Ireland's Boyne Valley, and north Wales are even more complex and impressive, with cross-shaped arrangements of chambers and passages. The workmanship on the stone blocks at Maeshowe for example is unknown elsewhere in northwest Europe at the time. Megalithic tombs appear to have been used by communities for the long-term deposition of the remains of their dead, and some seem to have undergone alteration and enlargement. The organization and effort required to erect these large stones suggest that the societies concerned placed great emphasis on the proper treatment of their dead. The ritual significance of the tombs is supported by the presence of megalithic art carved into the stones at some sites. Hearths and deposits of pottery and animal bone found by archaeologists around some tombs also implies that some form of burial feast or sacrificial rites took place there. Further examples of megalithic tombs include the stalled cairn at Midhowe in Orkney and the passage grave at Bryn Celli Ddu on Anglesey. There are also extensive grave sites with up to 60 megaliths at Louisenlund and Gryet on the Danish island of Bornholm. Despite its name, the Stone Tomb in Ukraine was not a tomb but rather a sanctuary. In association with the megalithic constructions across Europe, there are often large earthworks of various designs – ditches and banks (like the Dorset Cursus), broad terraces, circular enclosures known as henges, and frequently artificial mounds such as Silbury Hill in England and Monte d'Accoddi in Sardinia (the prehistoric step pyramid) . A lot of spirals are found through of Sardinia: the best known is Perda Pinta of Mamoiada. It seems that spirals were an important motif for the megalith builders (see Megalithic Temples of Malta). They have been found carved into megalithic structures all over Europe, along with other symbols such as lozenges, eye-patterns, zigzags in various configurations, and cup and ring marks. While not a written script in the modern sense of the term, these symbols are considered to have conveyed meaning to their creators, and are remarkably consistent across the whole of Europe. In Europe megaliths are, in general, constructions erected during the Neolithic or late stone age and Chalcolithic or Copper Age (4500–1500 BC). The megalithic structures of Malta are believed to be the oldest in Europe. Perhaps the most famous megalithic structure is Stonehenge in England. In Sardinia, in addition to dolmens, menhirs and circular graves there are also more than 8000 megalithic structure made by a Nuragic civilisation, called Nuraghe: buildings similar to towers (sometimes with really complex structures) made using only rocks. They are often near giant's grave or the other megalithic monuments. The French Comte de Caylus was the first to describe the Carnac stones. Pierre Jean-Baptiste Legrand d'Aussy introduced the terms menhir and dolmen, both taken from the Breton language, into antiquarian terminology. He mistakenly interpreted megaliths as gallic tombs. In Britain, the antiquarians Aubrey and Stukeley conducted early research into megaliths. In 1805, Jacques Cambry published a book called Monuments celtiques, ou recherches sur le culte des Pierres, précédées d'une notice sur les Celtes et sur les Druides, et suivies d'Etymologie celtiques, where he proposed a Celtic stone cult. This unproven connection between druids and megaliths has haunted the public imagination ever since. In Belgium, there are the Wéris megaliths at Wéris, a little town situated in the Ardennes. In the Netherlands, megalithic structures can be found in the northeast of the country, mostly in the province of Drenthe. Knowth is a passage grave of the Brú na Bóinne neolithic complex in Ireland, dating from c. 3500–3000 BC. It contains more than a third of the total number of examples of megalithic art in all Europe, with over 200 decorated stones found during excavations. c. 9500 BC: Construction in Asia Minor (Göbekli Tepe); from proto-Hattian or else a yet-to-be-discovered culture (the oldest religious structure in the world). Submerged by around 7400 BC: a 12m long monolith probably weighing around 15000 kg found 40m under water in the Strait of Sicily south-west of Sicily whose function is unknown. 7th or 8th millennium BC: Problematic date (by optically stimulated luminescence) of Quinta da Queimada Menhir in western Algarve (Portugal); "a very early period of megalithic activity in the Algarve, older than in the rest of Europe and in parallel, to some extent, with the famous Anatolian site of Göbekli Tepe"
c. 7000 BC: Construction in proto-Canaanite Israel (Atlit Yam). c. 5000 BC: Emergence of the Atlantic Neolithic period, the age of agriculture along the western shores of Europe during the sixth millennium BC pottery culture of La Almagra, Spain near by, perhaps precedent from Africa. c. 4850 BC: Constructions in Malta (Skorba temples). c. 4800 BC: Constructions in Brittany (Barnenez) and Poitou (Bougon). c. 4500 BC: Constructions in south Egypt (Nabta Playa). c. 4300 BC: Constructions in south Spain (Dolmen de Alberite, Cádiz). c. 4000 BC: Constructions in Brittany (Carnac), Portugal (Great Dolmen of Zambujeiro, Évora), France (central and southern), Corsica, Spain (Galicia), England and Wales, Constructions in Andalusia, Spain (Villa Martín, Cádiz), Construction in proto-Canaanite Israel c. 4000~3000 BC: Constructions in the rest of the proto-Canaanite Levant, e.g. Rujm el-Hiri and dolmens. c. 3700 BC: Constructions in Ireland (Knockiveagh and elsewhere). c. 3600 BC: Constructions in England (Maumbury Rings and Godmanchester), and Malta (Ġgantija and Mnajdra temples). c. 3500 BC: Constructions in Spain (Málaga and Guadiana), Ireland (south-west), France (Arles and the north), Malta (and elsewhere in the Mediterranean), Belgium (north-east), and Germany (central and south-west). c. 3400 BC: Constructions in Sardinia (circular graves), Ireland (Newgrange), Netherlands (north-east), Germany (northern and central) Sweden and Denmark. c. 3200 BC: Constructions in Malta (Ħaġar Qim and Tarxien). c. 3000 BC: Constructions in Sardinia (earliest construction phase of the prehistoric altar of Monte d'Accoddi), France (Saumur, Dordogne, Languedoc, Biscay, and the Mediterranean coast), Spain (Los Millares), Sicily, Belgium (Ardennes), and Orkney, as well as the first henges (circular earthworks) in Britain. c. 2500 BC: Constructions in Brittany (Le Menec, Kermario and elsewhere), Italy (Otranto), Sardinia, and Scotland (northeast), plus the climax of the megalithic Bell-beaker culture in Iberia, Germany, and the British Isles (stone circle at Stonehenge). With the bell-beakers, the Neolithic period gave way to the Chalcolithic, the age of copper. c. 2400 BC: The Bell-beaker culture was dominant in Britain, and hundreds of smaller stone circles were built in the British Isles at this time. c. 2000 BC: Constructions in Brittany (Er Grah), Italy : (Bari); Sicily (Cava dei Servi, Cava Lazzaro);, and Scotland (Callanish). The Chalcolithic period gave way to the Bronze Age in western and northern Europe. c. 1800 BC: Constructions in Italy (Giovinazzo, in Sardinia started the nuragic civilisation). c. 1500 BC: Constructions in Portugal (Alter Pedroso and Mourela). c. 1400 BC: Burial of the Egtved Girl in Denmark, whose body is today one of the best-preserved examples of its kind. c. 1200 BC: Last vestiges of the megalithic tradition in the Mediterranean and elsewhere come to an end during the general population upheaval known to ancient history as the Invasions of the Sea Peoples. Nabta Playa at the southwest corner of the western Egyptian desert was once a large lake in the Nubian Desert, located 500 miles south of modern-day Cairo. By the 5th millennium BC, the peoples in Nabta Playa had fashioned an astronomical device that accurately marks the summer solstice. Findings indicate that the region was occupied only seasonally, likely only in the summer when the local lake filled with water for grazing cattle. There are other megalithic stone circles in the southwestern desert. Namoratunga, a group of megaliths dated 300 BC, was used by Cushitic-speaking people as an alignment with star systems tuned to a lunar calendar of 354 days. This discovery was made by B. N. Lynch and L. H. Robins of Michigan State University. Additionally, Tiya in central Ethiopia has a number old megaliths. Some of these ancient structures feature engravings, and the area is a World Heritage Site. Megaliths are also found within the Valley of Marvels in the East Hararghe area. Northern-style megalithic burial from Jukrim-ri, Gochang-eub, North Jeolla Province, Korea. Megalithic burials are found in Northeast and Southeast Asia. They are found mainly in the Korean Peninsula. They are also found in the Liaoning, Shandong, and Zhejiang in China, the East Coast of Taiwan, Kyūshū and Shikoku in Japan, Đồng Nai Province in Vietnam and South Asia. Some living megalithic traditions are found on the island of Sumba and Nias in Indonesia. The greatest concentration of megalithic burials is in Korea. Archaeologists estimate that there are 15,000 to 100,000 southern megaliths in the Korean Peninsula. Typical estimates hover around the 30,000 mark for the entire peninsula, which in itself constitutes some 40% of all dolmens worldwide (see Dolmen). Northeast Asian megalithic traditions originated in northeast China, in particular the Liao River basin. The practice of erecting megalithic burials spread quickly from the Liao River Basin and into the Korean Peninsula, where the structure of megaliths is geographically and chronologically distinct. The earliest megalithic burials are called "northern" or "table-style" because they feature an above-ground burial chamber formed by heavy stone slabs that form a rectangular cist. An oversized capstone is placed over the stone slab burial chamber, giving the appearance of a table-top. These megalithic burials date to the early part of the Mumun pottery period (c. 1500–850 BC) and are distributed, with a few exceptions, north of the Han River. Few northern-style megaliths in northeast China contain grave goods such as Liaoning bronze daggers, prompting some archaeologists to interpret the burials as the graves of chiefs or preeminent individuals. However, whether a result of grave-robbery or intentional mortuary behaviour, most northern megaliths contain no grave goods. Southern-style megalithic burials are distributed in the southern Korean Peninsula. It is thought that most of them date to the latter part of the Early Mumun or to the Middle Mumun Period. Southern-style megaliths are typically smaller in scale than northern megaliths. The interment area of southern megaliths has an underground burial chamber made of earth or lined with thin stone slabs. A massive capstone is placed over the interment area and is supported by smaller propping stones. Most of the megalithic burials on the Korean Peninsula are of the southern type. Representations of a dagger (right) and two human figures, one of which is kneeling (left), carved into the capstone of Megalithic Burial No. 5, Orim-dong, Yeosu, Korea. As with northern megaliths, southern examples contain few, if any, artifacts. However, a small number of megalithic burials contain fine red-burnished pottery, bronze daggers, polished groundstone daggers, and greenstone ornaments. Southern megalithic burials are often found in groups, spread out in lines that are parallel with the direction of streams. Megalithic cemeteries contain burials that are linked together by low stone platforms made from large river cobbles. Broken red-burnished pottery and charred wood found on these platforms has led archaeologists to hypothesize that these platform were sometimes used for ceremonies and rituals. The capstones of many southern megaliths have 'cup-marks' carvings. A small number of capstones have human and dagger representations. These megaliths are distinguished from other types by the presence of a burial shaft, sometimes up to 4 m in depth, which is lined with large cobbles. A large capstone is placed over the burial shaft without propping stones. Capstone-style megaliths are the most monumental type in the Korean Peninsula, and they are primarily distributed near or on the south coast of Korea. It seems that most of these burials date to the latter part of the Middle Mumun (c. 700–550 BC), and they may have been built into the early part of the Late Mumun. An example is found near modern Changwon at Deokcheon-ni, where a small cemetery contained a capstone burial (No. 1) with a massive, rectangularly shaped, stone and earthen platform. Archaeologists were not able to recover the entire feature, but the low platform was at least 56×18 m in size. People on Nias Island in Indonesia move a megalith, c. 1915. Digitally restored. The Indonesian archipelago is the host of Austronesian megalith cultures both past and present. Living megalith cultures can be found on Nias, an isolated island off the western coast of North Sumatra, the Batak people in the interior of North Sumatra, on Sumba island in East Nusa Tenggara and also Toraja people from the interior of South Sulawesi. These megalith cultures remained preserved, isolated and undisturbed well into the late 19th century. Several megalith sites and structures are also found across Indonesia. Menhirs, dolmens, stone tables, and ancestral stone statues were discovered in various sites in Java, Sumatra, Sulawesi, and the Lesser Sunda Islands. The Cipari megalith site also in West Java displays monoliths, stone terraces, and sarcophagi. Lore Lindu National Park in Central Sulawesi houses ancient megalith relics such as ancestral stone statues, mostly located in the Bada, Besoa and Napu valleys. Megalithic dolmen in Marayoor, India. Megaliths in South Asia are dated before 3000 BC, with recent findings dated back to 5000 BC in southern India. Megaliths are found in almost all parts of South Asia. There is also a broad time evolution with the megaliths in central India and the upper Indus valley where the oldest megaliths are found, while those in the east are of much later date. A large fraction of these are assumed to be associated with burial or post burial rituals, including memorials for those whose remains may or may not be available. The case-example is that of Brahmagiri, which was excavated by Wheeler (1975) and helped establish the culture sequence in south Indian prehistory. However, there is another distinct class of megaliths that do not seem to be associated with burials. In South Asia, megaliths of all kinds are noted; these vary from Menhirs, Rock-cut burial, chamber tomb, dolmens, stone alignment, stone circles and anthropomorphic figures. These are broadly classified into two (potentially overlapping) classes (after Moorti, 1994, 2008): Sepulchral (containing remains of the dead), or memorial stones where mortal remains along with funerary objects are placed; and Non-sepulchral including large patterned placement of stones over a wide area. The 'non-sepulchral' type is associated with astronomy and cosmology in South Asia and in other parts of the world (Menon and Vahia, 2010). In the context of prehistoric anthropomorphic figures in India, (Rao 1988/1999, Upinder Singh 2008) note that it is unclear what these giant anthropomorphs symbolize. They usually occur in association with megalithic monuments and are located in megalithic burial grounds, and may have been connected with ancestor worship. Megaliths occur in many parts of Melanesia, mainly in Milne Bay Province, Fiji and Vanuatu. Few excavations has been made and little is known about the structures. The megalith tomb Otuyam at Kiriwina has been dated to be approximately 2,000 years old which indicates that megaliths are an old custom in Melanesia. However very few megaliths have been dated. The constructions have been used for different rituals. For example, tombs, sacrifices and rituals of fecundity. Dance sites exist next to some megaliths. In some places in Melanesia rituals are continued to be held at the sacred megalith sites. The fact that the beliefs are alive is a reason that most excavations have been stopped at the sites. Megalithic structures in Micronesia reach their most developed form on the islands of Pohnpei and Kosrae in the Eastern Caroline Islands. On these two islands there was extensive use of prismatic basalt columns to build upland building complexes such as those at Salapwuk on Pohnpei and Menka on Kosrae. These building sites, remote from the ocean, appear to have been abandoned early. Megalithic building then shifted to constructing networks of artificial islands on the coast that supported a multitude of common, royal and religious structures. Dating of the structures is difficult but the complex at Nan Madol on Pohpei was probably inhabited as early as 800 c.a. probably as an artificial islands with the more elaborate buildings and religious structures added to the site from 1000–1400 AD. Megaliths were used for a variety of purposes ranging from serving as boundary markers of territory, to a reminder of past events, and to being part of the society's religion. Common motifs including crooks and axes seem to be symbols of political power, much as the crook was a symbol of Egyptian pharaohs. Amongst the indigenous peoples of India, Malaysia, Polynesia, North Africa, North America, and South America, the worship of these stones, or the use of these stones to symbolize a spirit or deity, is a possibility. In the early 20th century, some scholars believed that all megaliths belonged to one global "Megalithic culture" (hyperdiffusionism, e. g. ‘the Manchester school’, by Grafton Elliot Smith and William James Perry), but this has long been disproved by modern dating methods. Nor is it believed any longer that there was a pan-European megalithic culture, although regional cultures existed, even within such a small areas as the British Isles. The archaeologist Euan Mackie wrote, "Likewise it cannot be doubted that important regional cultures existed in the Neolithic period and can be defined by different kinds of stone circles and local pottery styles (Ruggles & Barclay 2000: figure 1). No-one has ever been rash enough to claim a nationwide unity of all aspects of Neolithic archaeology!" Dolmen: a free-standing chamber, consisting of standing stones covered by a capstone as a lid. Dolmens were used for burial and were covered by mounds. Taula: a straight standing stone, topped with another forming a 'T' shape. Menhir: a large single upright standing stone. Trilithon: Two parallel upright stones with a horizontal stone (lintel) placed on top, e.g. Stonehenge. Orthostat: an upright slab forming part of a larger structure. Plain of Jars ranging from the Khorat Plateau in Thailand in the south, through Laos and to Dima Hasao of northerneastern India. Straße der Megalithkultur – tourist route from Osnabrück to Oldenburg via some 33 Megalithic sites. ^ Price, T. Douglas; Feinman, Gary M. (2005). "Glossary". Images of the Past (Student Edition 4th ed.). McGraw-Hill Higher Education. Archived from the original on September 30, 2017. Retrieved July 28, 2018. ^ Herbert, A. Cyclops Christianus, or the supposed Antiquity of Stonehenge. London, J. Petheram, 1849. ^ "Glossary of Cemetery Terms". Rochester's History: An Illustrated Timeline. n.d. Definition of megalith. Archived from the original on June 5, 2013. Retrieved July 28, 2018. ^ Johnson, W. (1908) p. 67. Retrieved July 28, 2018. ^ "The World's First Temple". Archaeology magazine. Nov–Dec 2008. p. 23. ^ Birch, Nicholas (22 April 2008). "7,000 years older than Stonehenge: the site that stunned archaeologists" – via The Guardian. ^ Scheltema, H.G. (2008). Megalithic Jordan; an introduction and field guide. Amman, Jordan: The American Center of Oriental Research. ^ "Atlit-Yam, Israel". , from the feature by Jo Marchant (Nov 28, 2009). "Drowned cities: Myths and secrets of the deep". ^ Schulz Paulsson, B. (2019-02-11). "Radiocarbon dates and Bayesian modeling support maritime diffusion model for megaliths in Europe". Proceedings of the National Academy of Sciences. 116 (9): 3460–3465. doi:10.1073/pnas.1813268116. ISSN 0027-8424. PMC 6397522. PMID 30808740. ^ Salvatore Piccolo, op. cit., pp. 14-17. ^ "Louisenlund tæt ved Østermarie på Bornholm", Europage.dk. (in Danish) Retrieved 14 November 2012. ^ Lodolo, Emanuele; Ben-Avraham, Ben (September 2015). "A submerged monolith in the Sicilian Channel (central Mediterranean Sea): Evidence for Mesolithic human activity". Journal of Archaeological Science: Reports. 3: 398–407. doi:10.1016/j.jasrep.2015.07.003. Retrieved 1 September 2015. ^ Calado, Manuel (2015). "Menhirs of Portugal:all Quiet on the Western Front?". Statues-menhirs et pierres levéesdu Néolithique à aujourd’hui. Saint-Pons-de-Thomières: Direction régionale des affaires culturelles Languedoc-RoussillonGroupe Archéologique du Saint-Ponais. pp. 243–253. Retrieved 1 September 2016. ^ Andrew L. Slayman (May 27, 1998). "Neolithic Skywatchers". Archaeology. Retrieved 2007-03-21. ^ Alan Hall (April 6, 1998). "Ancient Alignments". Scientific American. Retrieved 2015-12-27. ^ J. Clendenon. "Nabta". Archived from the original on 2009-05-03. Retrieved 2007-03-21. ^ Goindol [Megalith] in Hanguk Gogohak Sajeon [Dictionary of Korean Archaeology], National Research Institute of Cultural Heritage (ed.) NRICH, Seoul. ISBN 89-5508-025-5 pp. 72-75. ^ Rhee, Song-nai; Choi, Mong-lyong (1992). "Emergence of Complex Society in Prehistoric Korea". Journal of World Prehistory. 6 (1): 68. doi:10.1007/bf00997585. ^ GARI [Gyeongnam Archaeological Research Institute] (2002) Jinju Daepyeong Okbang 1 - 9 Jigu Mumun Sidae Jibrak [The Mumun Period Settlement at Localities 1 - 9, Okbang in Daepyeong, Jinju]. GARI, Jinju. ^ I.G.N. Anom; Sri Sugiyanti; Hadniwati Hasibuan (1996). Maulana Ibrahim; Samidi (eds.). Hasil Pemugaran dan Temuan Benda Cagar Budaya PJP I (in Indonesian). Direktorat Jenderal Kebudayaan. p. 87. ^ "Archived copy". Archived from the original on 2010-02-23. Retrieved 2009-12-10. CS1 maint: Archived copy as title (link)|Lore Lindu National Park, Central Sulawesi. ^ P, Pavan. "Megalith from 5000 BC found in Telangana". timesofindia. ^ Anuja, Geetali (2002). "Living Megalithic practices amongst the Madia gonds of Bhamragad, District Gadchiroli, Maharashtra". Puratattva. 32 (1): 244. ^ N.Vahia, M. Menon, Abbas, Yadav & p.4. ^ N.Vahia, M. Menon, Abbas, Yadav & p.3-4. ^ Singh, Upinder (2008). A History of Ancient and Early Medieval India. New Delhi: Pearson Education. p. 252. ISBN 978-81-317-1120-0. A Fleming, "Megaliths and post-modernism. The case of Wales". Antiquity, 2005. A Thom, "Megaliths and Mathematics". Antiquity, 1966. Turnbull, D (2002). "Performance and Narrative, Bodies and Movement in the Construction of Places and Objects, Spaces and Knowledges: The Case of the Maltese Megaliths". Theory, Culture & Society. 19 (5–6): 125–143. doi:10.1177/026327602761899183. J McKim Malville, F Wendorf, AA Mazar, R Schild, "Megaliths and Neolithic astronomy in southern Egypt". Nature, 1998. Hiscock, P (1996). "The New Age of alternative archaeology of Australia". Archaeology in Oceania. 31 (3): 152–164. doi:10.1002/j.1834-4453.1996.tb00358.x. Archived from the original on 2007-06-10. Asthana, S. (1976). History and archaeology of India's contacts with other countries, from earliest times to 300 B.C.. Delhi: B.R. Pub. Corp.
Deo, S. B. (1973). Problem of South Indian megaliths. Dharwar: Kannada Research Institute, Karnatak University. Goblet d'Alviella, E., & Wicksteed, P. H. (1892). Lectures on the origin and growth of the conception of God as illustrated by anthropology and history. London: Williams and Norgate. Goudsward, D., & Stone, R. E. (2003). America's Stonehenge: the . Boston: Branden Books. Keane, A. H. (1896). Ethnology. Cambridge: University Press. Johnson, Walter (1908). Folk-Memory: Or, The Continuity of British Archaeology. Oxford: Clarendon Press. Lancaster Brown, P. (1976). Megaliths, myths, and men: an introduction to astro-archaeology. New York: Taplinger Pub. Co.
Moffett, M., Fazio, M. W., & Wodehouse, L. (2004). A world history of architecture. Boston: McGraw-Hill. Nelson, Sarah M. (1993) The Archaeology of Korea. Cambridge University Press, Cambridge. Stukeley, W., Burl, A., & Mortimer, N. (2005). Stukeley's 'Stonehenge': an unpublished manuscript, 1721-1724. New Haven [Conn.]: Yale University Press. Subbayya, K. K. (1978). Archaeology of Coorg with special reference to megaliths. Mysore: Geetha Book House. Tyler, J. M. (1921). The new stone age in northern Europe. New York: C. Scribner's Sons. Wikimedia Commons has media related to Megaliths. This page was last edited on 10 April 2019, at 05:13 (UTC).